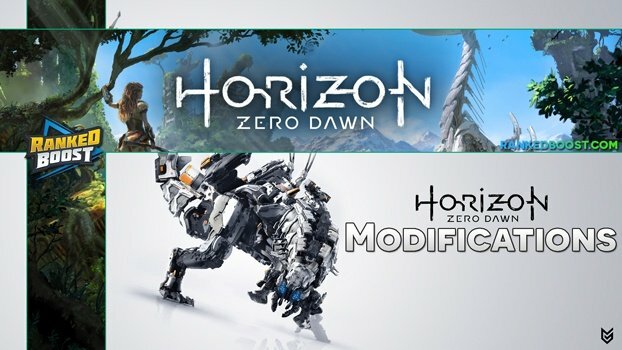 Welcome to our Horizon Zero Dawn Best Modification List, below we will list how mods work in Horizon Zero Dawn and what type of stats they buff for your items. What Are Horizon Zero Dawn Weapon Modifications? Each weapon has a specific amount of Slots for Modifications, also known as “mods” for short. These Horizon Zero Dawn Modifications will boost the stats of your weapons and can add elemental type attribute damage. Depending on the rarity of the weapon will determine how many Modification Slot will be available. Also, keep note that mods will appear as these 3 different types of rarities with Very Rare being the Best Modifications In Horizon Zero Dawn. Players should note that you can also mod your outfits as well using the Crafting menu. IMPORTANT NOTE: Once you have installed a Mod on a Weapon or Outfit it CANNOT be removed. Until you Purchase the High-Level Tinker Ability to remove Mods later in the Game. Once you have chosen an item, you should see GRAY circles. Press X on one of the Circles and then select the Modification you want to Equip. Mods not only boost standard damage but they can also boost you elemental damage attributes such as Shock, Freeze, Tear, and Fire. At the moment it appears that the Best Modifications In Horizon Zero Dawn are the Standard Damage Boost ones. These early game are the most effective since most enemy machines are naturally weak against FIRE/BURN damage. Many machines WEAK POINTS are vulnerable to tear damage and will take a lot more damage from these damage boosts.